← World Cup Brazil 2014, Part Six. 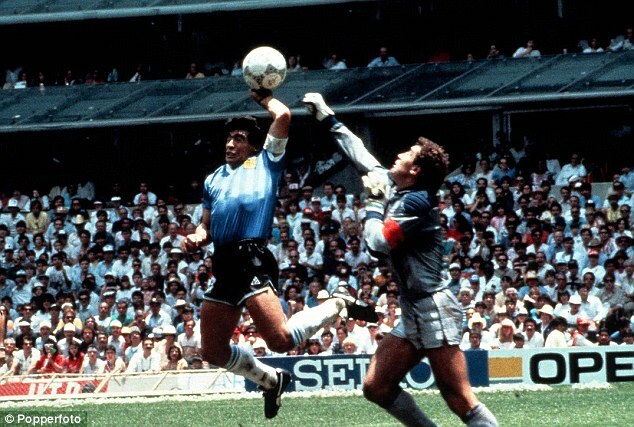 The “Hand of God” goal, pictured in your link, was in a 1986 knockout game against England. It put ARG up 1-0, and they went on to win 2-1. That looks like a much closer call than the 1986 version, at least from that TV angle. It was a much closer call, and frankly it would’ve been easy to miss. The last replay is the one that convinced me. The ball changes direction before it hits his chest. …doesn’t necessarily prove Maradona’s guilt (has it hit his arm by this point? ), but does make it easier to rationalize how the ref missed it. If the ref’s line of sight is roughly in line with Maradona’s torso, viewed from the side, then arm-contact might easily look like chest-contact.